The researchers, for the first time, have devised a model to identify the risk of acute respiratory distress syndrome (ARDS) in patients with burn injury. Results, published in the journal Annals of Surgery, have demonstrated that the prediction model includes three factors the extent of the patient’s inhalation injury, whether the patient had high levels of a blood clotting protein called von Willebrand factor and the percentage of the patient’s body that was burned. Majid Afshar, Loyola University Health Sciences Campus, Maywood, Illinois, and colleagues conducted the study to derive and validate a prediction model for the development of ARDS in burn-injured patients. “The 3-variable model with %TBSA, inhalation injury, and von Willebrand factor can be used for both the study and prevention of ARDS in patients with burn injury,” write the authors. ARDS is a form of respiratory failure caused by inflammation and the inability to exchange oxygen appropriately. Patients typically are put on ventilators, and many don’t survive. ARDS usually occurs in patients who already are critically ill from predisposing conditions such as sepsis, pneumonia, burns, inhalation injury, traumatic injuries, etc. Burn injuries, especially those involving inhalation injuries, have the highest incidence of ARDS among all predisposing conditions. Previously, patients with large burns had high mortality rates so few survived to develop ARDS. Treatments have greatly improved in the past 20 years and now more patients are surviving major burns. More than 25 percent of patients with large burns or major inhalation injuries who survive the first 24 hours will develop ARDS. The prospective multicenter study included 113 adult patients who were treated at Loyola Medicine’s Burn Center and the University of Colorado’s Burn Center. The patients had burns over at least 10 percent of their bodies and/or were suspected of having inhalation injury. Among the biomarkers measured in patients with burn injuries, a one-standard-deviation increase in log-transformed levels of the A2 domain of von Willebrand factor in the first 24 hours was most strongly associated with the development of ARDS. Of candidate models, a 3-variable model with %TBSA, inhalation injury, and von Willebrand factor-A2 had comparable discrimination to more complex models. The 3-variable model had good model fit by Hosmer–Lemeshow test (P = 0.74) and maintained similar discrimination after accounting for performance optimism. About one-third (33.6 percent) developed ARDS a median of 2.2 days after their injuries. In developing their prediction model, researchers examined clinical characteristics including burn and inhalation injury, alcohol misuse, and current tobacco use; other health problems including diabetes, congestive heart failure, heart disease and chronic obstructive pulmonary disease (COPD); and five protein biomarkers found in plasma (the colorless fluid part of blood). Among multiple prediction models examined, a model consisting of inhalation injury, the von Willebrand factor biomarker and the percent of body burned did the best job of predicting which patients were most likely to develop ARDS. 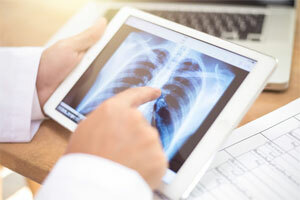 “Once the model is validated by other studies, it could guide clinical trials designed to prevent ARDS and identify burn patients who are at risk for ARDS,” conclude the authors.